Number (N)ine bandana made from authentic Number (N)ine pocket lining fabric salvaged from a closing mill in Japan. 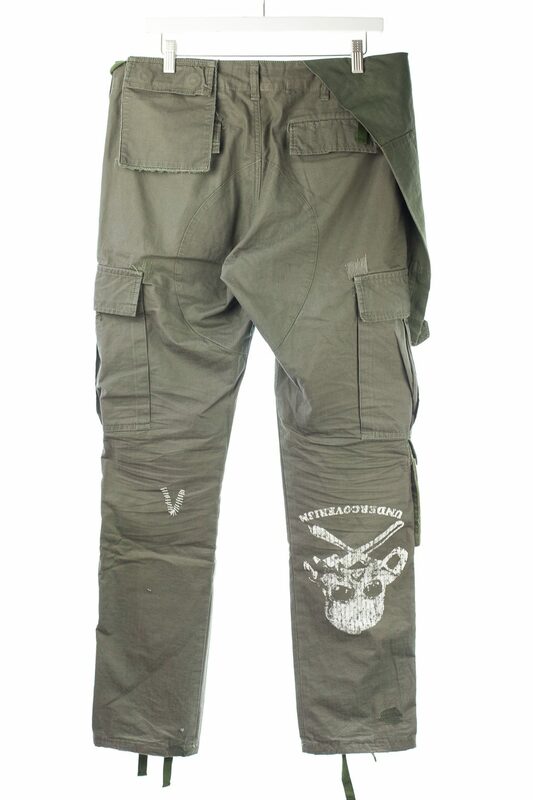 The "mechanic" print was used in various pocket lining in pants from the mid to late 2000's during Miyashita's reign at his own house before selling it off in 09. 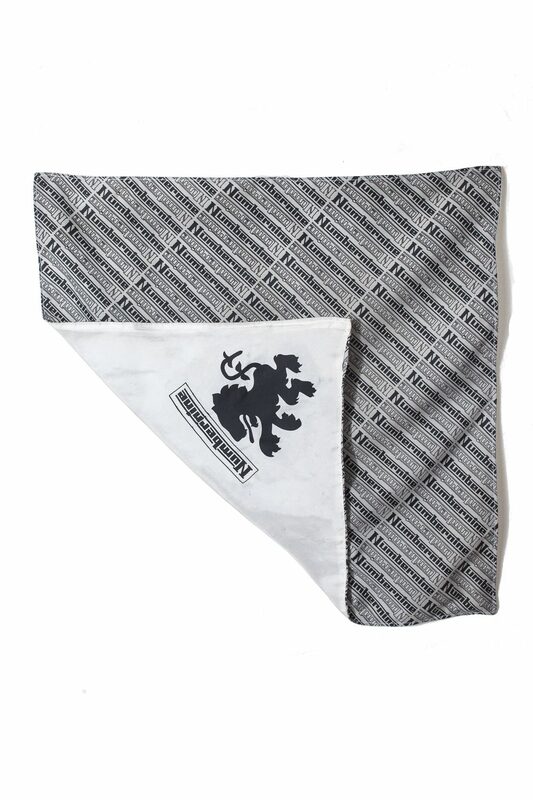 Bandana is lined with white silk with a print of the Lamborghini print Miyashita used in the early 00's. These bandanas are made in house in collaboration with Worn On LA as catalyst to our upcoming production facility set to start cutting & sewing later this quarter. Number (N)ine’s “Mechanic” logo-type designed by Takashi Komatsu is idiosyncratic of the brand’s creator Takahiro Miyashita’s larger narrative. Logo-flips were one of the first graphical techniques he practiced when the brand first started in 1997, usually referencing the visual language of music genres that resonated with him at a younger age. The Mechanic logo-type first appeared during the S/S 2000 “Extra Heavy” collection, applied as patches on outerwear, inline fabric on pockets, and screen-printed on numerous garments. The mechanic design effortlessly characterized the Golden Age of Rock n’ Roll, and has continually resonated with members of streetwear culture, ensuring its place within the canon of staple graphics. 65 of these bandanas are only available. 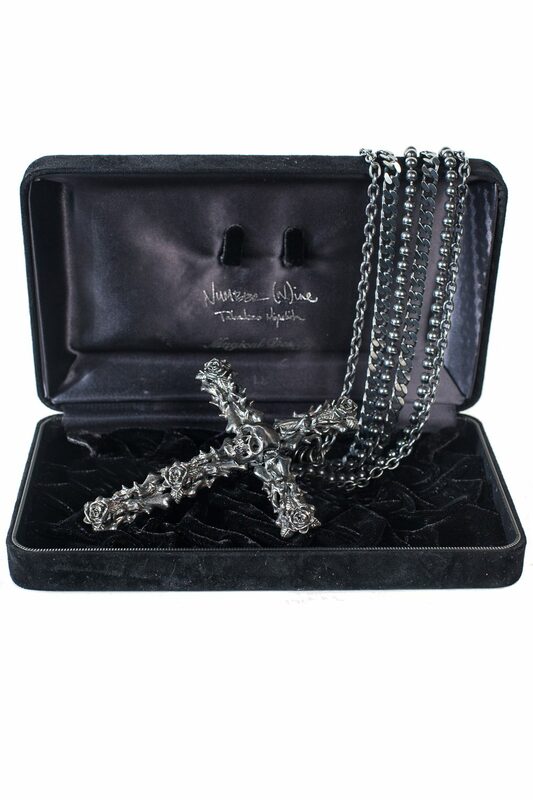 22" x 22"
Number (N)ine SS06 "Welcome to the Shadow" Black Diamond Cross Necklace. 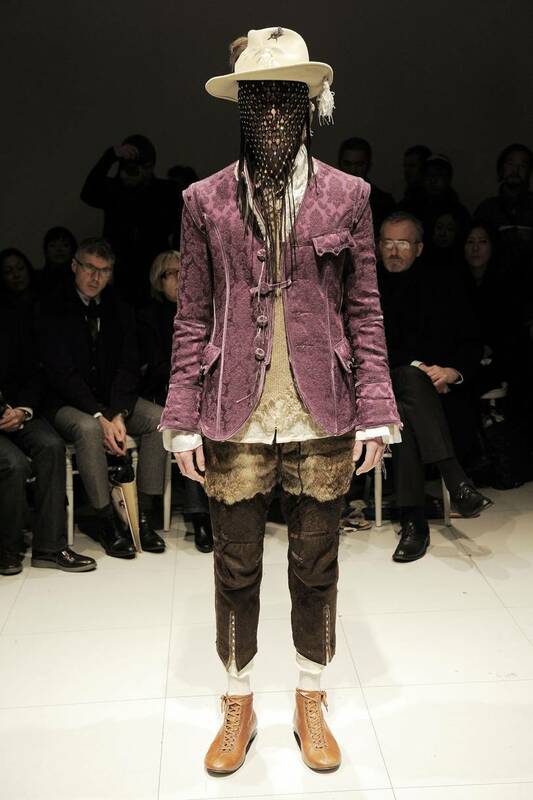 Takahiro Miyashita's SS06 is a jab at Axl Rose's persona. Runway looks consisted of nearly identical outfits of Rose's stage looks with different branding. Pants were missing from some models, jetset bath robes worn on others, egregious and gaudy accessories were fitted with each look. SS06 also produced a Magical Design x N(N) jewelry collaboration set with black diamonds and fitted with .950 silver. Roses, victorian patterns, rock star motifs were key elements in the jewelry design in chime with the theme of the season. 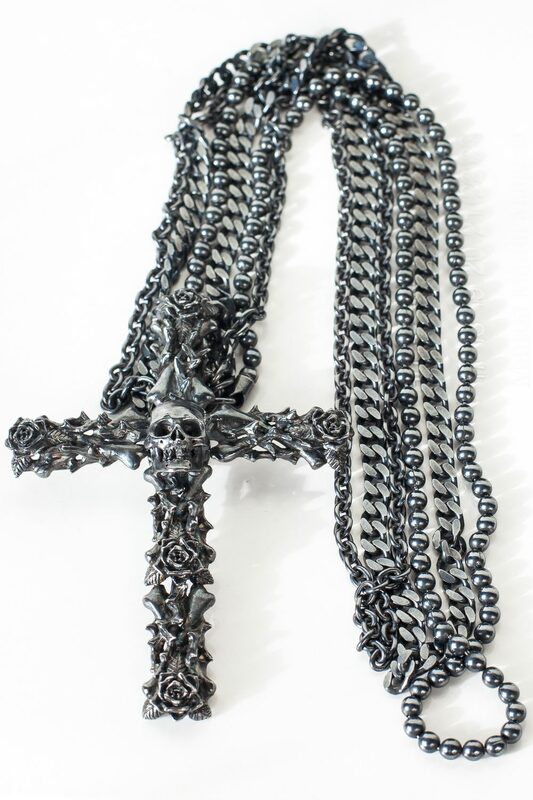 This cross necklace is one of the items offered from the collaboration in very low quantities. 3 Chains hold on the pendant; A gunmental silver piece with roses, bones and thorns form in a cross with a skull as a centerpiece. Black diamonds set on each 5 roses. 9.5/10 condition. Long Chain. 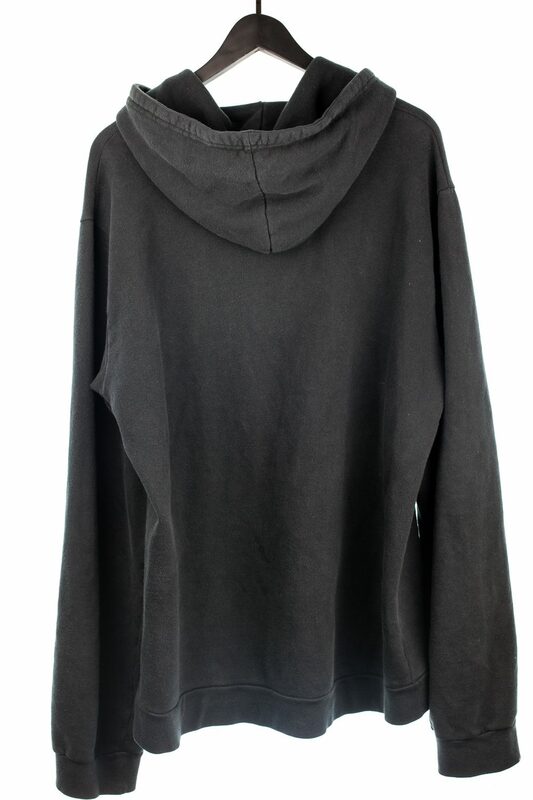 Issey Miyake early 00's Sample Towelterry Jacket. Issey's designs fundamentals begin with the philosophy of "Apoc", or "A Piece of Cloth" which explores the relationship between body, fabric and the space between leading to Issey's fascination and innovation with technical fabrics and production techniques. APOC, started in the late 90's, uses computer aided fabric manufacturing to construct garments from a single thread. This resulted in complex graphics and displaced texturing which designs were all weaved into the fabric then cut & sewn. 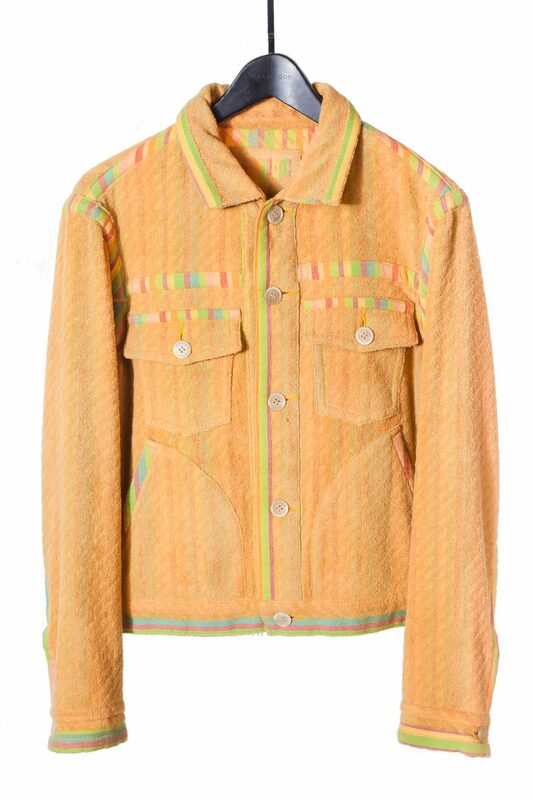 Towelterry jacket with weaved in multicoloured border designs. Classic, mid waist drop, long arms. Hand pockets. Button Placket. Sample item. 9/10 condition. Size 2, fits medium. 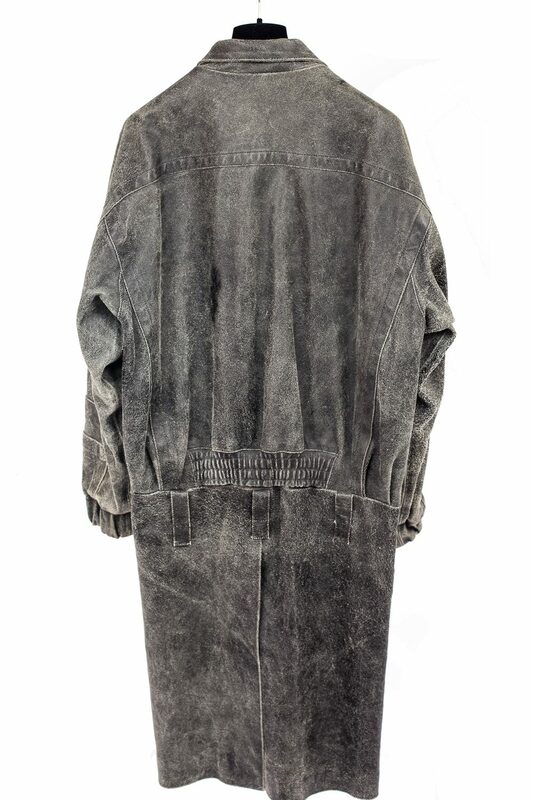 Raf Simons AW02-03 Virginia Creeper Distressed Heavy Leather Coat. A crimson key light, a runway in the vastness of the ominous woods and a penchant fondness of varsity nostalgia would best describe the Virginia Creeper AW02 season. The eerie, towering figures with muted colours reflect Raf’s observation of the duality of nature. This collection is more so immersed not by the graphics but with pieces like the coat shown here. 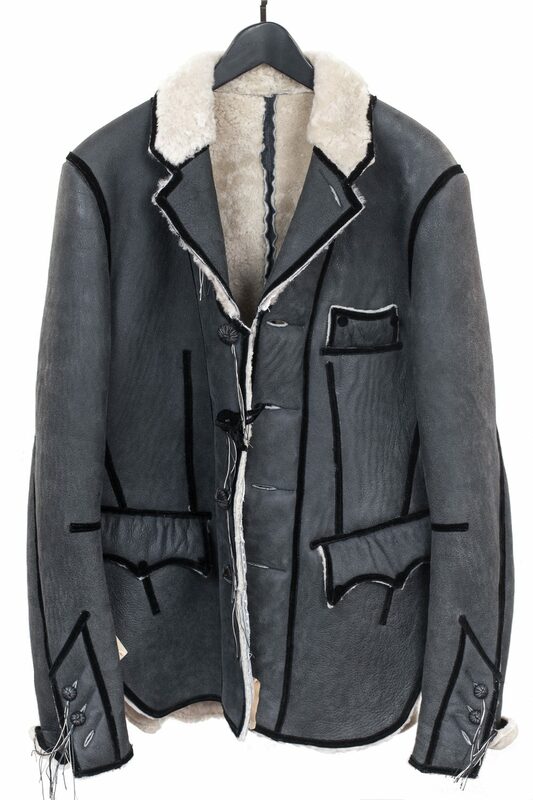 This heavy leather coat and similar variations were on the runway over multiple layers of outerwear, puffers, plastic raincoats and baggy trousers to emphasize the cast of the menacing and slouched cut out of the wearer. 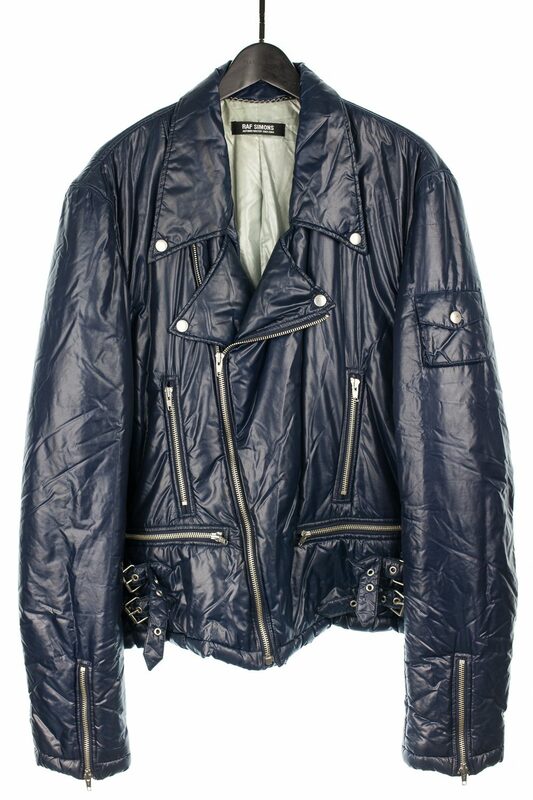 Heavily distressed leather throughout, with patched embellishments and reinforcements. Lined in cupro. Elastic waistband on back to cinch the fabric to the lower back side. 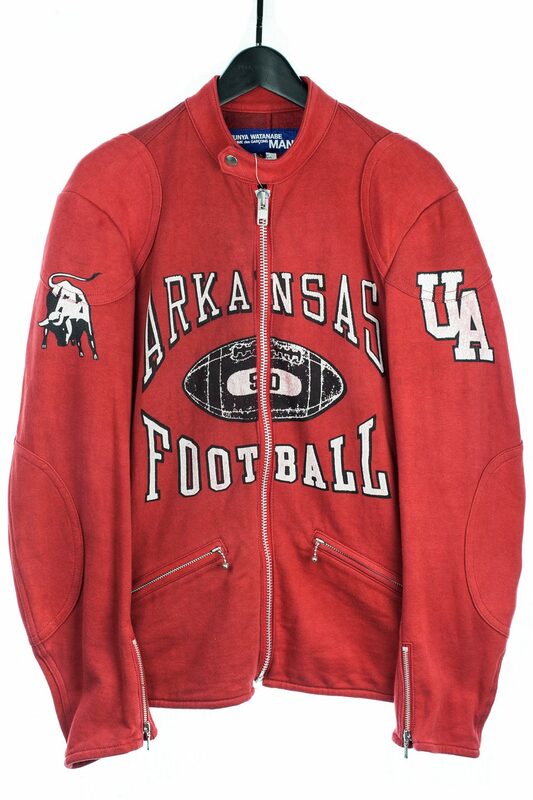 Zip down middle with oversized placket. 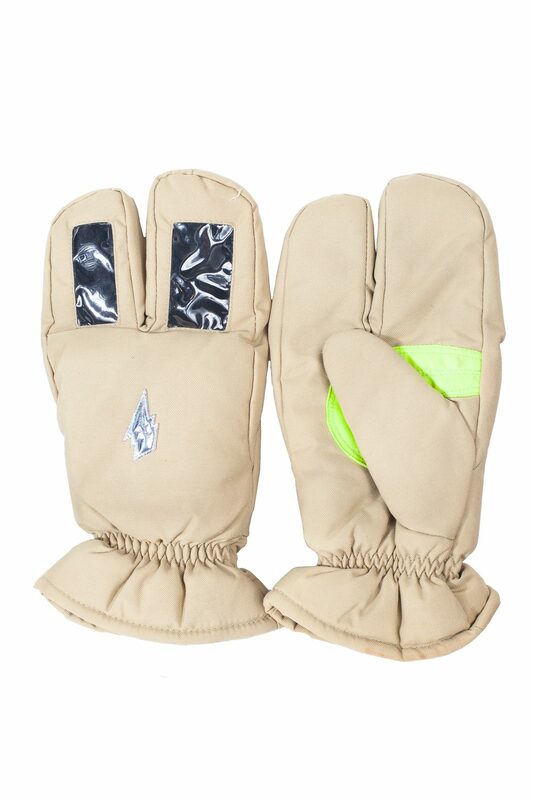 Made in limited quantities in comparison to the cotton variation. 9/10 condition. Unfortunately missing the belt but can be styled without it just fine. 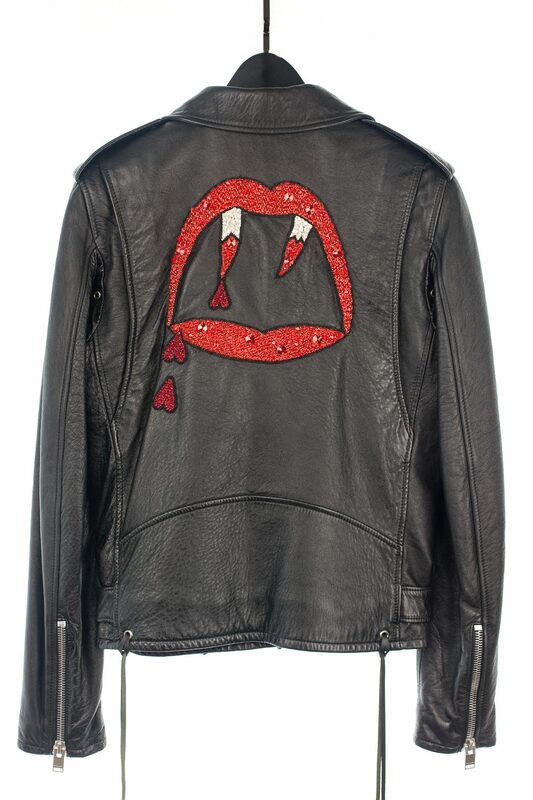 W&LT SS98 "A Fetish for Beauty" Wizzkid Jacket. W&LT, short for "Wild and Lethal Trash", was one of Walter Van Beirendoinck's now defunct offsprings alongside Aestheticterrorists. Beirendonck never compromised his creative control throughout his legacy paving way for unadulterated displays of his work that are celebrated in museums around the wold today. SS98 was no exception. The show, or better described as a choreographed performance, involved over 100 people in a 4 part extravaganza lasting nearly 30 minutes. Taken place on a red square center stage in Paris, the first act consisted of 30 "wizzkids" with cowboy hats doing a honkytonk style choreographed dance. The Second, 30 "White Trash" performers on stilts with drapey white costumed enveloped the stage. The third, 30 "Black Beauties", with dark, eerie and sinister Manson looks took the stage. The fourth, 40 ballroom dancer from "outer space", with masks, dresses and distantly victorian poise with swaravoski embellishments finalized the show. The stage dims, times passes, lights pop back up and a flood of cast, crew and Walter himself spend the rest of the show in an improvised rave. Muave coloured jacket with embellishments on sleeves. "Wizzkid" written across the front chest 7/10 condition. Faded, some sun bleaching around collar. 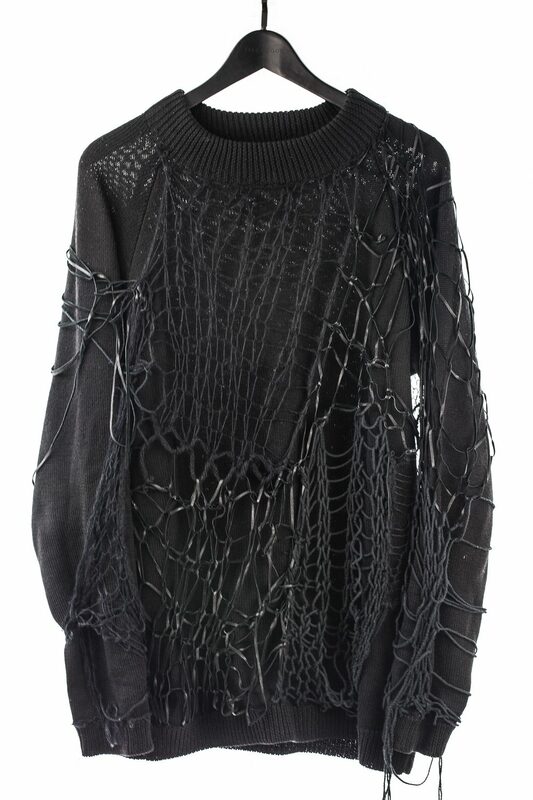 Raf Simons AW98 "Radioactivity" MultiMaterial Layered Knit. One of the earlier, underrated seasons, "Radioactivity" took cues from legendary synth pop group and kraut rock pioneer Kraftwerk. Footage and images available today show runway models walking down the catwalk with bold red button ups similar to what the Kraftwerk group members wore during a performance. 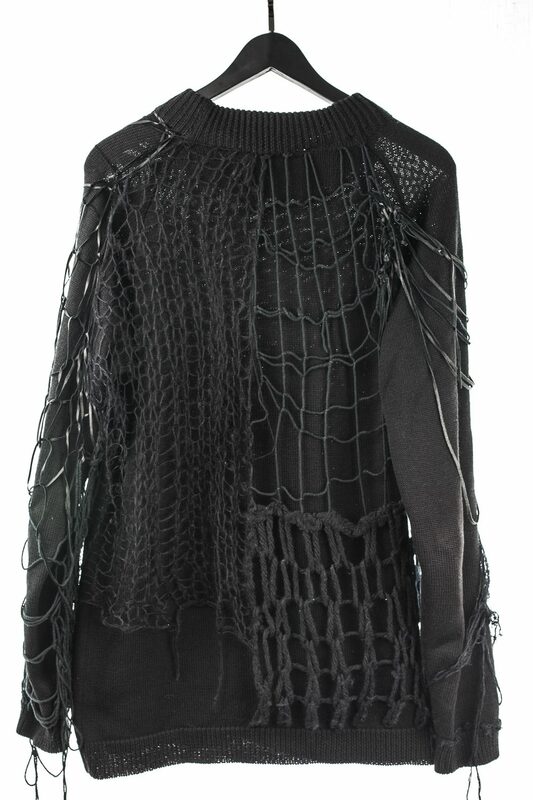 Mock neck knit with an intricate and crudely weaved paneled knit layered over the sweater consisting of leather, suede, high gauge wool, mohair, yarn. Long loose fit Sz 48, fits Loose M oversized. 7/10 condition, some of the layered knit portion unraveled from the base. 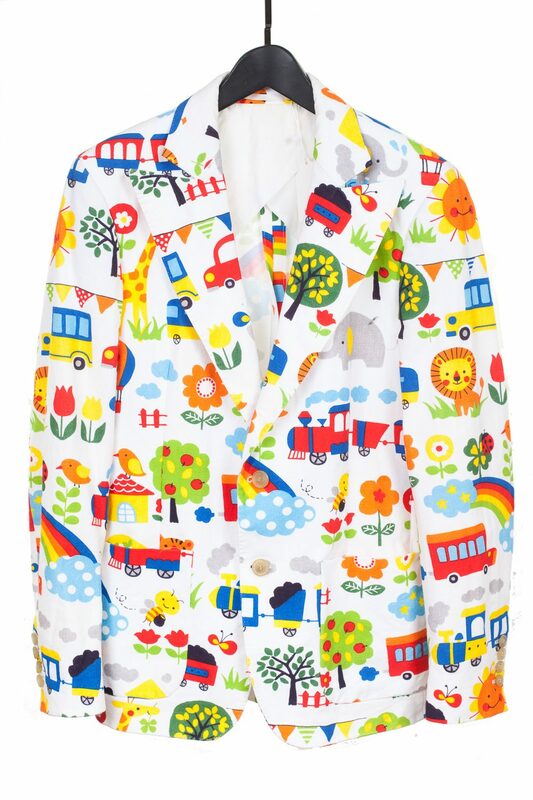 Walter Van Beirendonck SS16 "Electric Eye" Blazer. Designers that take a strong course of political activism within their work are scarce. As an artist, a sense of social responsibility is inherited when one has the privilege of carrying the megaphone. When it comes to fashion, expressing a designer's political agenda may result in harsh public rejection or controversy, which may be counter intuitive to a label's commercial interests, but yet as a notable designer a platform is open to convey their creative manifestations of what they please to the public. Walter Van Beirendonck, the father of Belgian fashion, remarkably doesn't come short of expressing his political beliefs but uses allusions and metaphors usually in a form of new fictitious characters season to season. "Electric Eye" derives from Bowie's "Moonage Daydream" and a Judas Priest song of the same title which references Orwell's "1984". For the SS16 season Walter conjures a character with a single eye on a black thundercloud signifying the current state of creeping surveillance, the "Big Brother". Said creature was plastered on elastic materials and cotton tops, accompanied with Walter's signature grand and madly extravagant expressions of patterns, hats, colours and cuts. The collection featured patterns typically resembling wallpaper of a pediatrician's waiting lobby or a Scholastic book fair poster. These patterns, according to Walter, are a stark contrast to the dark suits that were presented on the runway -- a visual statement which represents mankind's liberation from the ominous overseeing obumbration; The 'black clouds', the "Electric Eye". 8/10 condition, some mild stains in the inside of the blazer. Size 48. 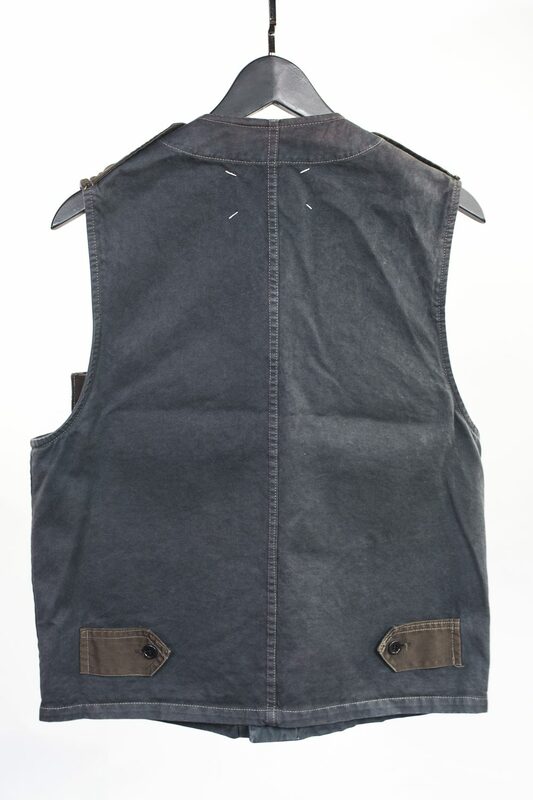 Maison Martin Margiela FW01 Artisanal Reconstructed Military Vest. Margiela's eponymous line, "010" and "0", are artisanal garments which paved a basis for the foundations of Margiela's core designs. 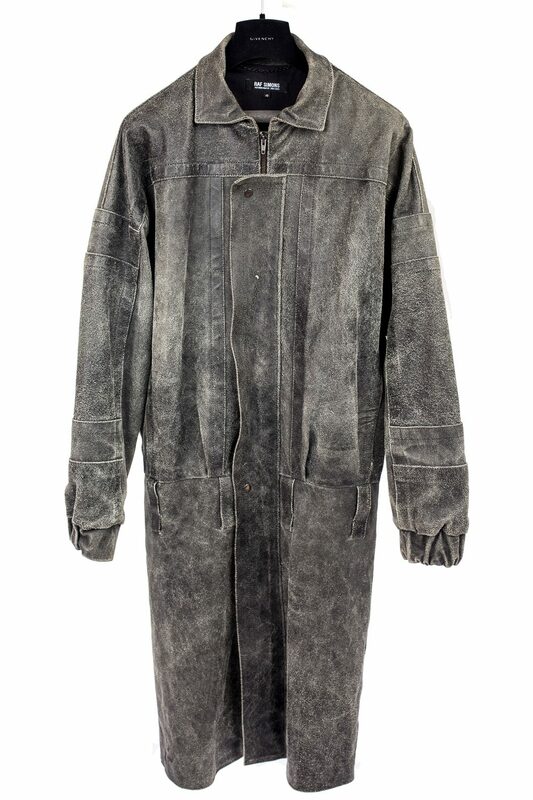 Reproductions and reinterpretations have been made over the years, even after Margiela's departure from his own label, but the original artisanal garments are hand sewn in low quantities by the Margiela team, at the atelier, with vintage or hand selected fabrics. 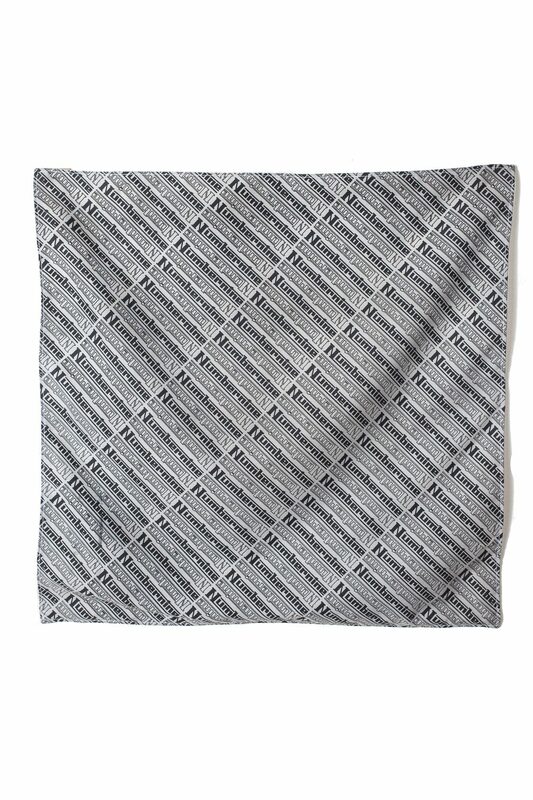 Due to the nature of the artisanal line's creative process, each "010" or "0" item has mild variations. The artisanal men's "010" line has been in a long hiatus until very recently reintroduced by now creative director Galliano. 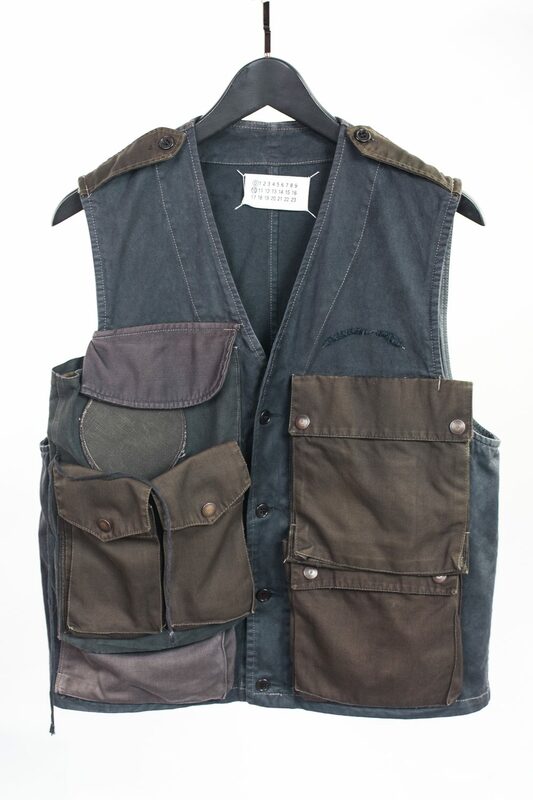 Vest was made from military cargo pants, jackets and utility pockets rearranged and placed on top of each other and protruding from the sides. 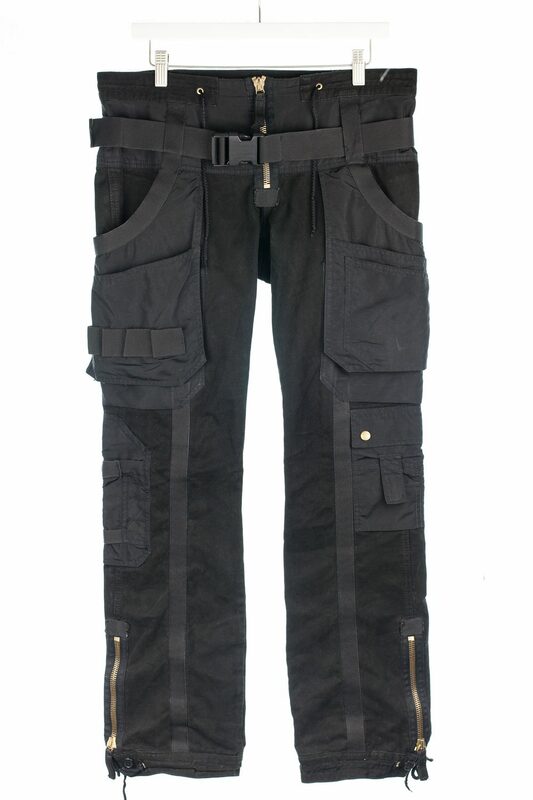 Pockets are lined in multiple materials with absent or replaced hardware. Each reconstructed pocket carries details which resemble the very nature of where the fabric originated. 8/10 condition. Sz M.
Rick Owens FW10 "Gleam" Mink Fur Bunny Crossbody Bag. An "Owenscorp" bag before the exotic-material label had a distinct tag separate from Rick Owens items. 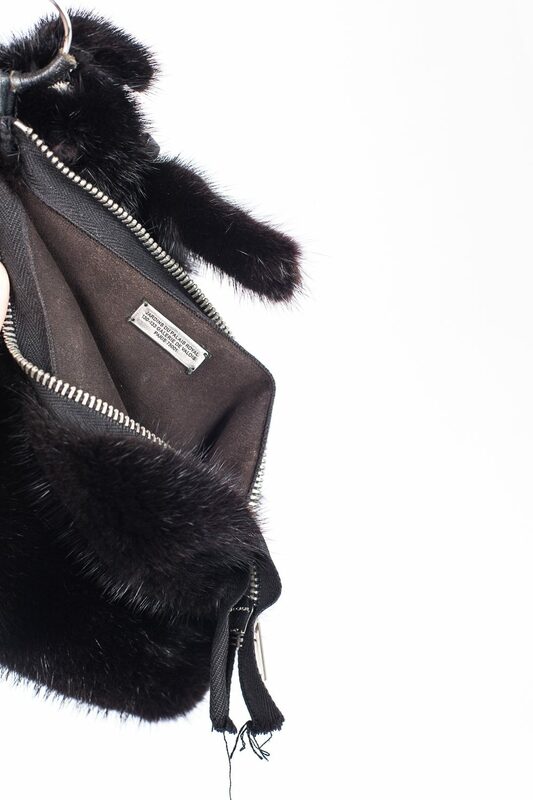 The Bunny bag is a cult staple with Rick Owens with multiple iterations of the mink fur bunny, including the reissued bunny pouch you see today, with nose, ears, tail and paw embellishments. This more practical iteration of the bunny bag was only released in select stores for FW10 Gleam and built on a playful reiteration of the FW08 mink fur bag. Contains a small 6"x 7" mink fur zip pouch large enough to hold daily items with room accompanied by a mini bunny charm and 18" drop leather strap. 7/10 condition. Bag has some loose strings, leather straps had a few minor tears in it which were rebonded. 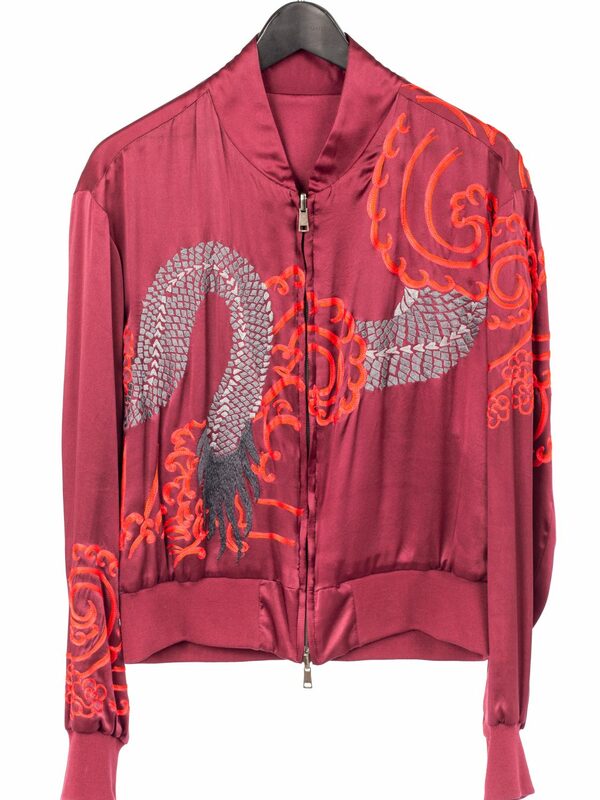 Gucci by Tom Ford SS01 Embroidered Silk Bomber in Red. Tom Ford spent the early 2000's at Gucci embodying the sexually proactive and vim of the surfaced, well-off, affluent youth. SS01 was the ramp up to the more extravagant pieces Ford pushed out. 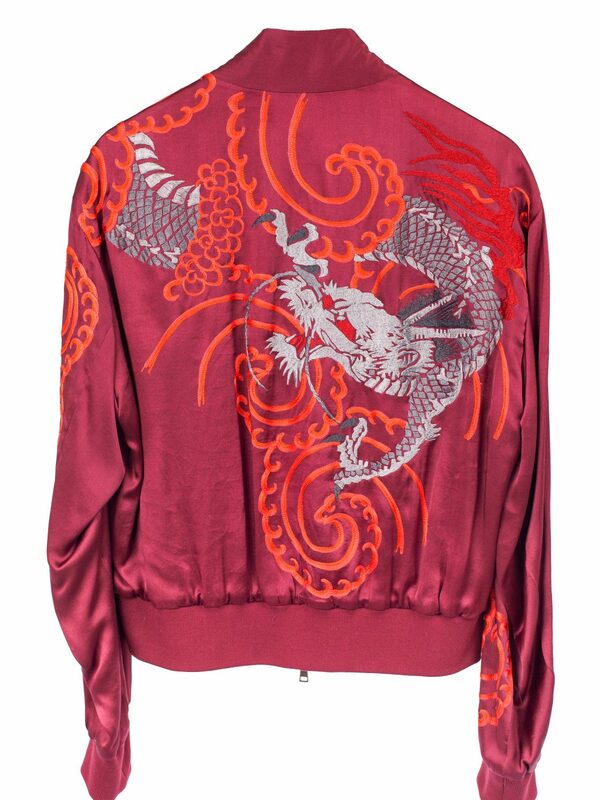 Full silk bomber, with silk dragon embroidery meticulously sewn throughout the crimson jacket. Sits a bit above the waist and loose around the upper body. 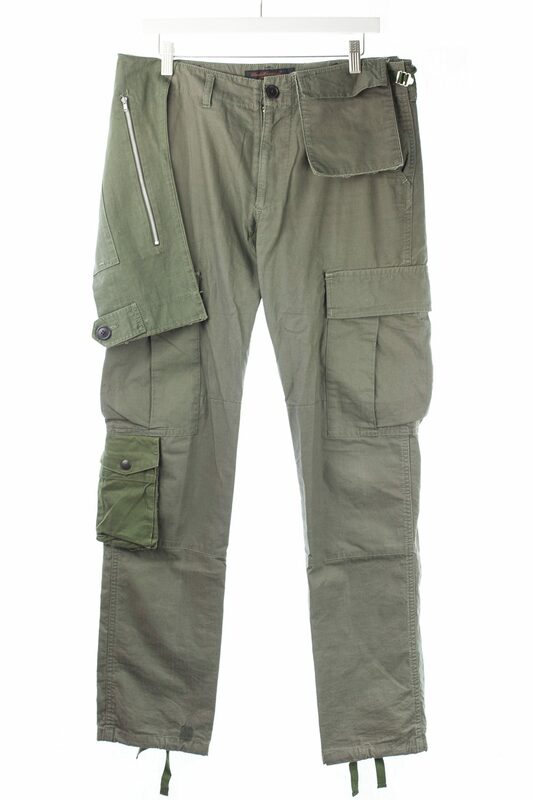 Completely reversible with pockets on the other side for a less stated look. 8/10 condition. Some loose threads. 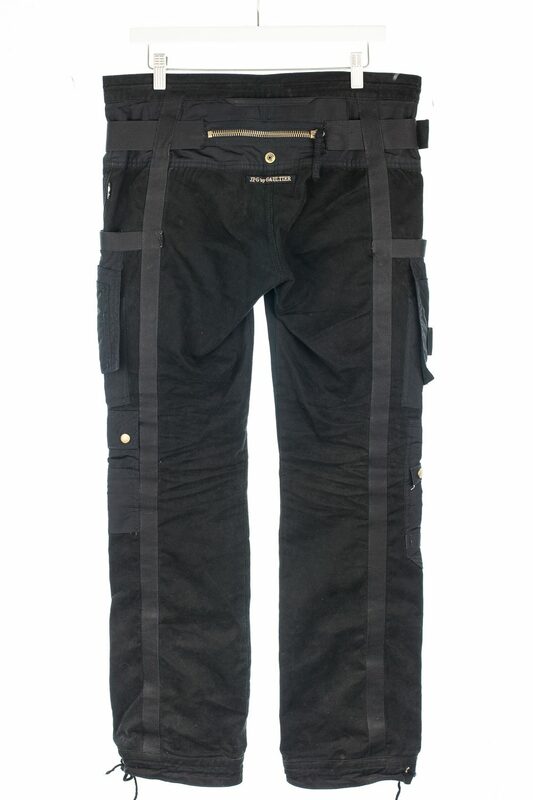 Sz 46, sits above waist and is loose on the body can accommodate a range of sizes. 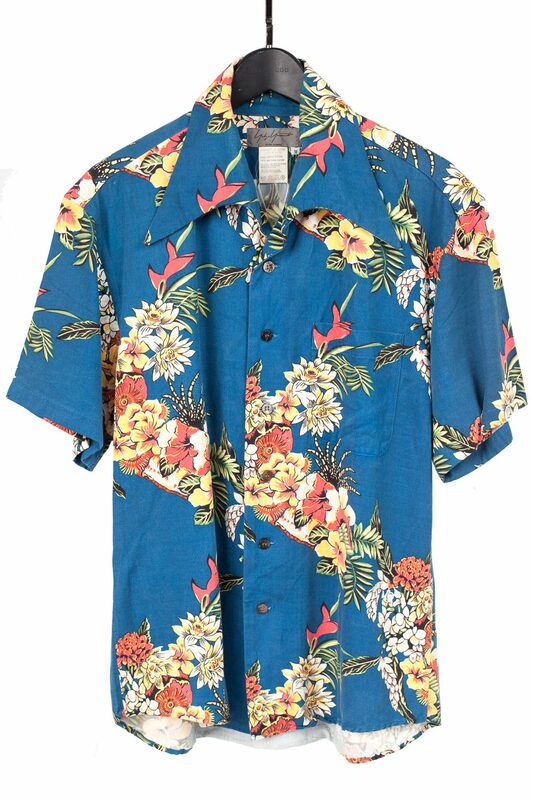 Yohji Yamamoto SS97 Rayon/Cotton Hawaiin. 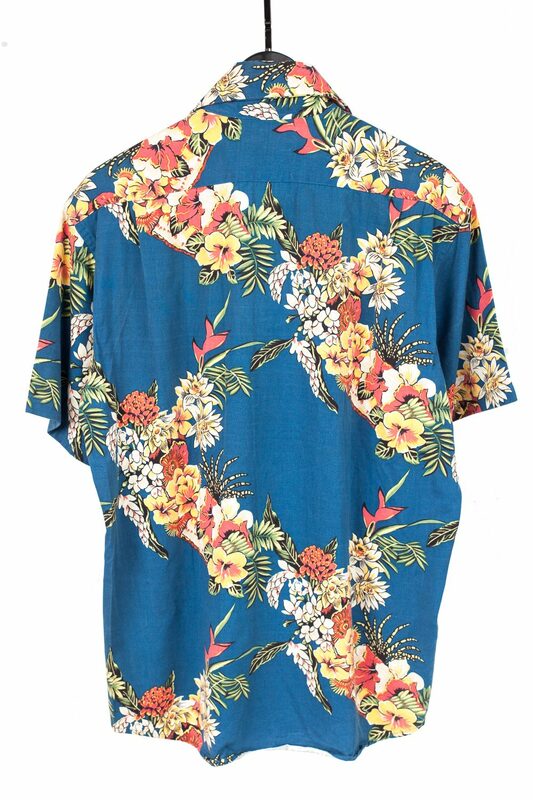 Deep blue base with vibrant floral design used throughout the season. 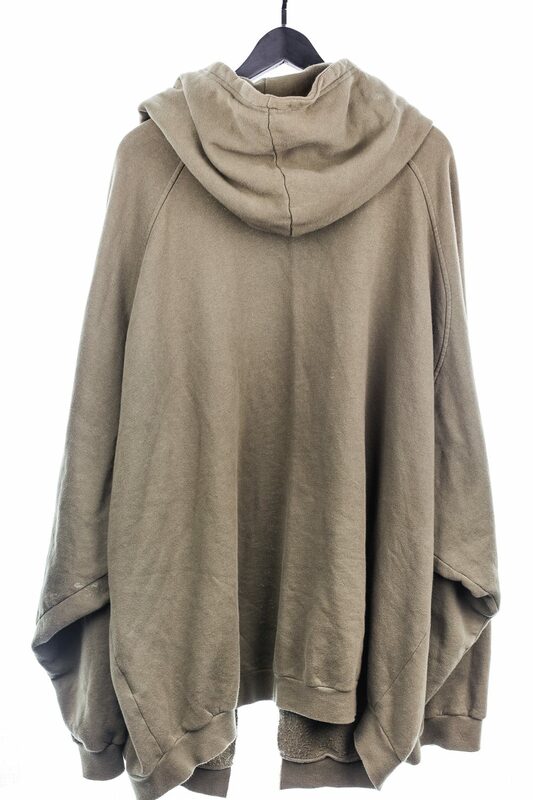 Linen/Rayon fabric is rather heavy, but soft and breathable for an easy to wear year round use. Oversized spread collar which emphasizes the top chest of the wearer. Yohji florals have a sharp and defining graphical fidelity to them typically applied with a fine sublimation technique which allows for detailed, vibrant prints. Standard chest and loose arms. 8/10 condition. 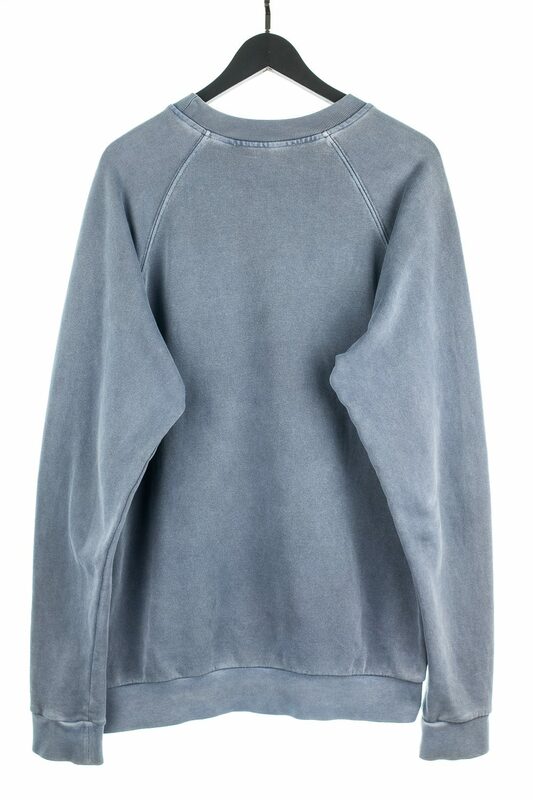 Size M, fits a relaxed M.
Calvin Klein 205w39nyc by Raf Simons Sample F&F Knit Crewneck. Sample knit crewneck never made it to production and was handed out to models that walked for Calvin Klein in 2017. 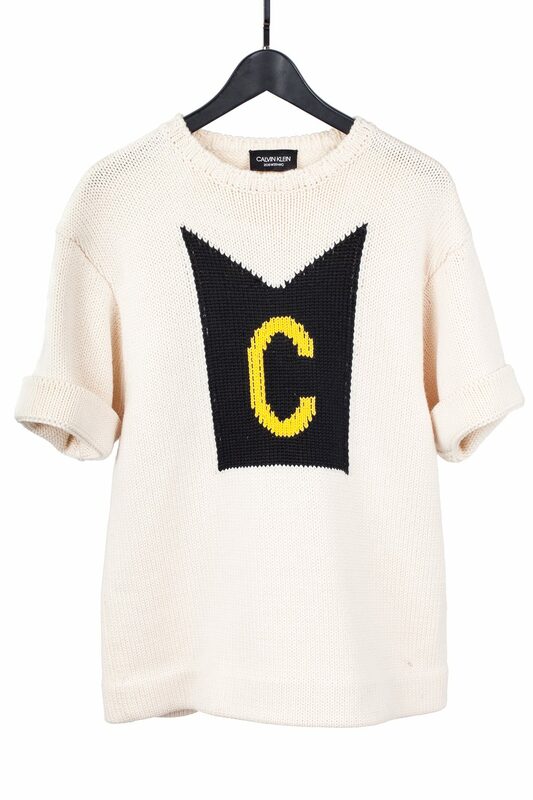 Collegiate "C" motif was applied throughout the designs of following 17/18 collections. Cream heavy knit wool. 9/10 condition. No size tag. 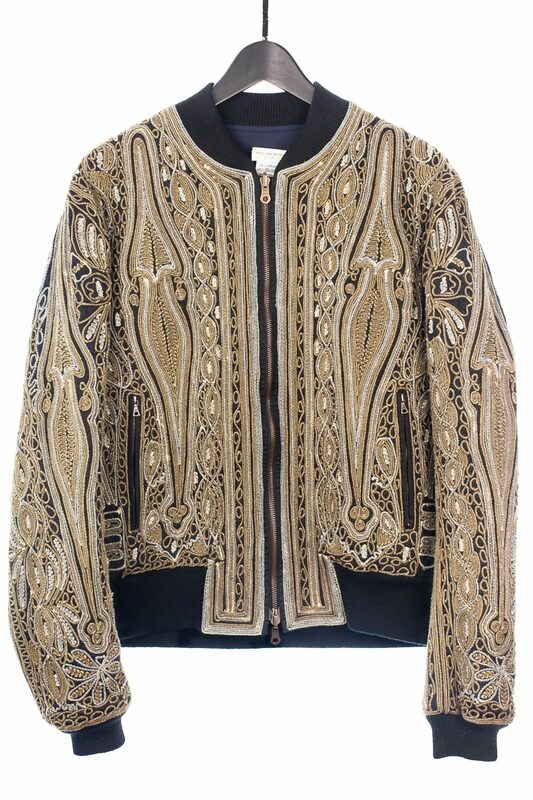 Saint Laurent SS17 Beaded/Crystal Leather Jacket. Iconic Bloodluster Motif on back. Soft Napa leather. New With Tags. Size 44, fits xs/s. 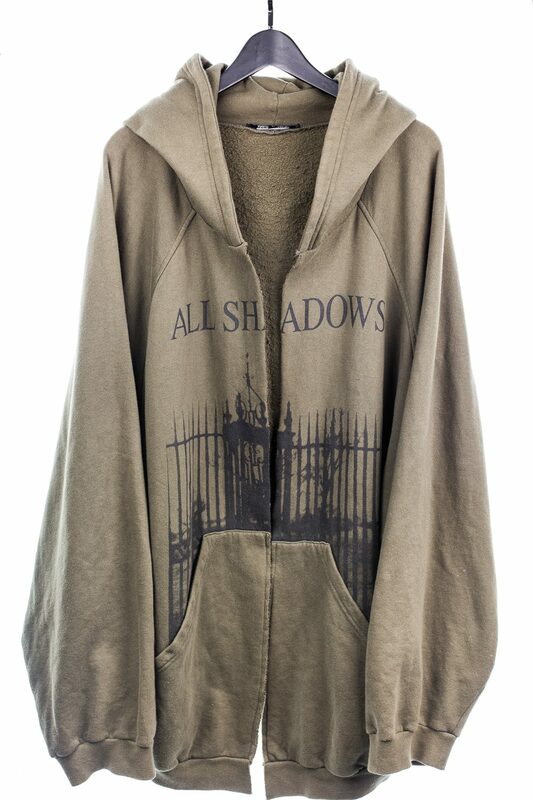 Raf Simons FW05 "History of My World" All Shadows Hoodie. Despite the runway being absent of the highly sought after graphics for this season, Simons looked to revisit his personal milestones in his past for the two part FW2005 collection. Raf's display to his connection to music is undoubtedly the primer to his most compelling garments. FW05 was one of the last displays of such meaning, departing from such endeavors and focusing more so on modernist, sleek cuts inspired by euro subcultures. Graphics throughout this season were labeled with cryptic lyrics from The Cure, graphics inspired by the 1982 film "Poltergeist", and even a few references to experimental musician John Cage. The hoodies, tees and sweaters were massive and overwhelming, patched with what looks like a collage of Raf's personal visual displays, with the help of peter de potter, of his inspirations and nostalgia. Just like the old days Caressing an old man And painting a lifeless face Just a piece of new meat in a clean room The soldiers close in under a yellow moon All shadows and deliverance Under a black flag A hundred years of blood Crimson 8/10 condition. Size 46, fits massive. 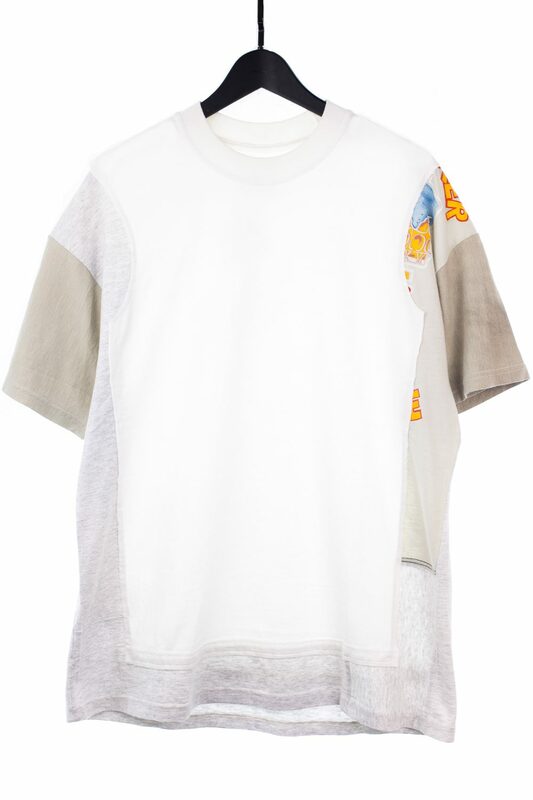 Issey Miyake Tee with graphics by Takashi Murakami. From the Issey Miyake Mens collection released in ~SS1999-2000 entitled “Smoothed Edges.” Within this collection Issey and Takashi experimented with pre-shrunken silhouettes, giving the graphics a visibly worn texture. 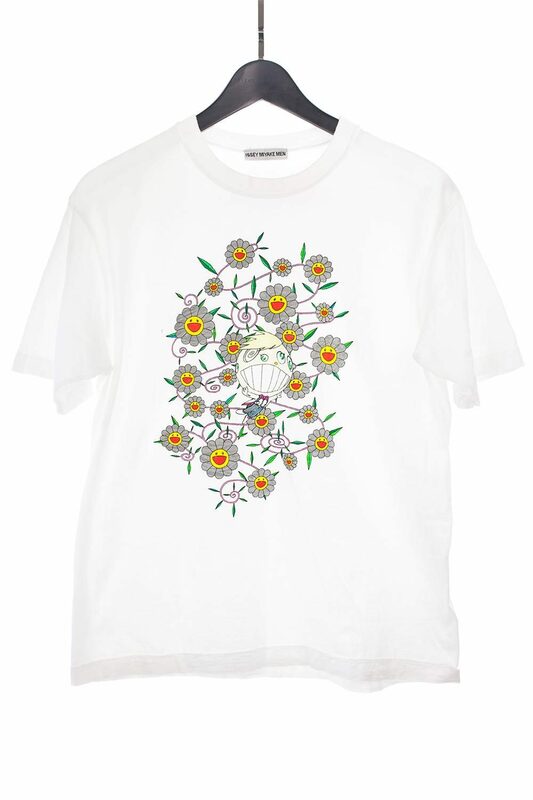 Takashi’s infamous character motifs, such as the “Flower of Joy,” serve as the focal point of this collaboration. 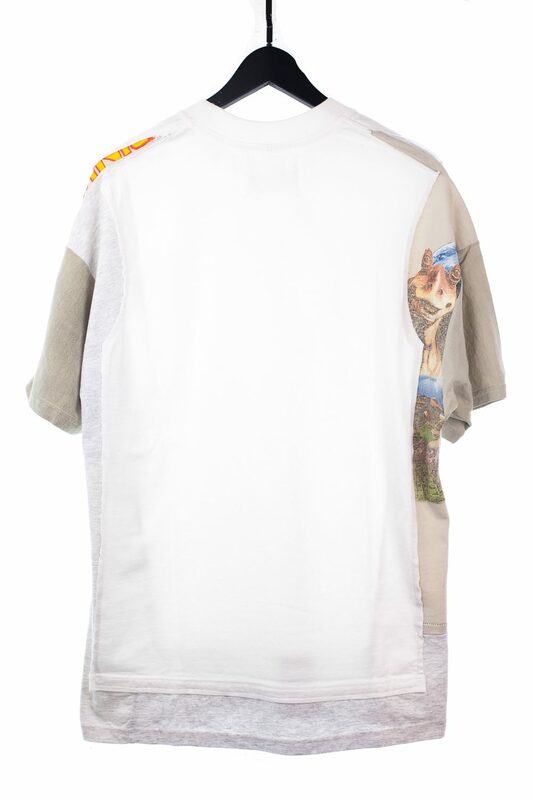 This is one of the earliest Murakami collaborations with any designer or artist making these tees rather difficult to find. Dries Van Noten SS15 Rope Embroidered Reversible Bomber. SS15 featured a New Deal muralist Richard Haines collaboration, half chest vests and floral rope embroidery. 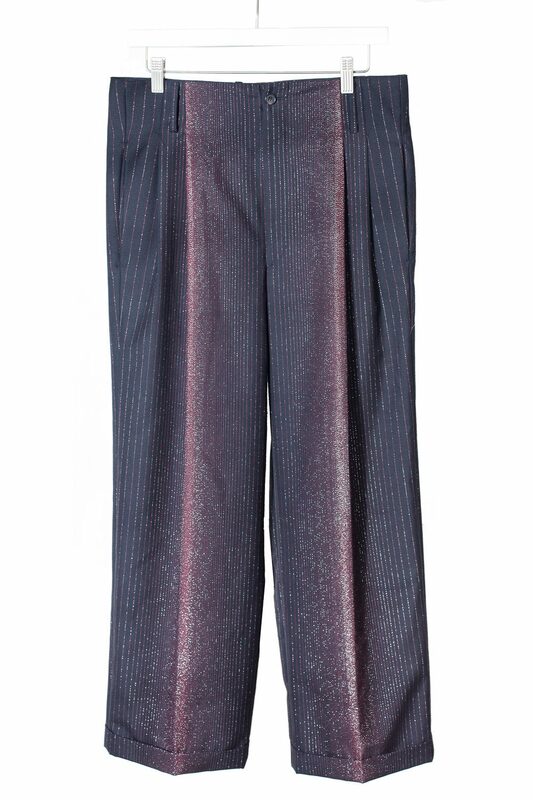 Models were fitted with silk or viscose shirts tucked under the 1st rendition of the signature cummerbund sweatpants. 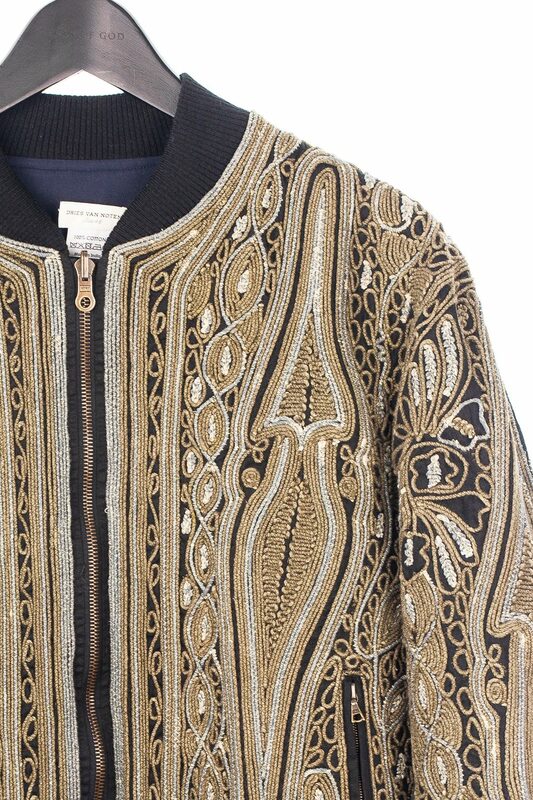 The jacket here is possibly the finest example of Dries Van Noten's iconic reversible bombers, sported with intricate all over rope embroidery in a marigold, black, and teal colourway. Incredible amount of detail a viewer can get lost in. Reversible into a covert cotton navy side to dampen the wearer's visual presence when need be. Riri reversible zipper. 9/10 condition. Neck tag is loose. Size 48, should fit a medium. Jacket sits firmly at waist. 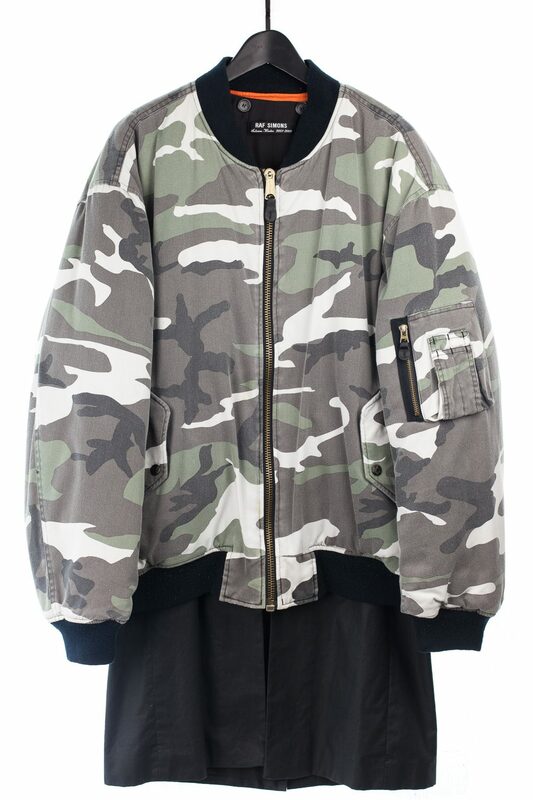 Raf Simons Fw01 "Riot Riot Riot" Skirted Camo Bomber. As Raf's garments become more and more coveted, only circulating in the tucked away collector's marketplace, it becomes harder to document the pieces that actually hold historical and aesthetic significance as they become harder to come in hand. 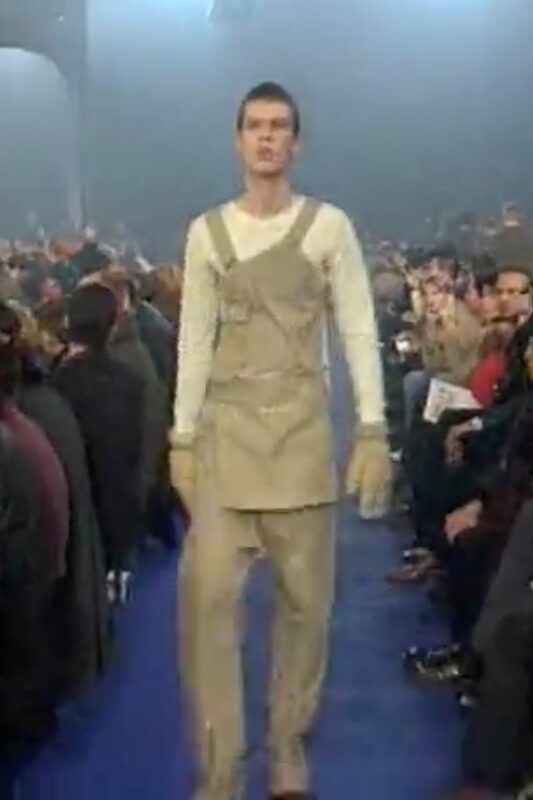 Held at an abandoned warehouse in Paris, fog machines spewing smoke, Aphex Twin blaring overhead was Raf's most influential and iconic runway: FW01 "Riot! Riot! Riot! ", dedicated to isolated hero Richey Edwards from the Manic Street Preachers. 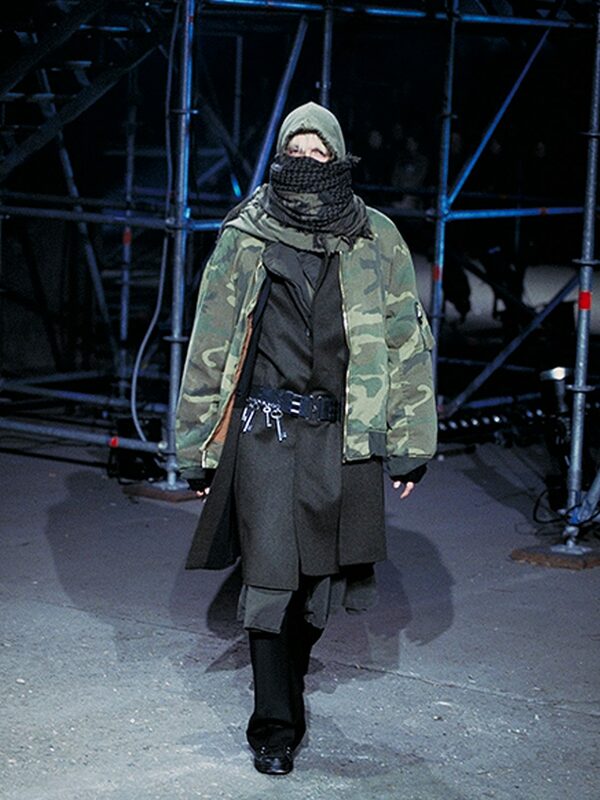 Models were coded in black, grey, olive and muddy colours, completely covered in scarves, outerwear, baggy pants, oversized everything. This was a massive turn for Raf, as his previous collections consisted of sartorial, slim, finely cut and precisely designed garments which were influenced by upperclass youth. Undoubtedly influential to current day designers, but mostly ignored by the hoi polloi at its time. “At the flea market in Vienna, I saw youngsters from the Ukraine or Romania, who simply lay layer by layer and thus create their own volumes because of the cold,” Neue Zürcher Zeitung Raf captured the ethos of iconoclasm with this season. The runway was filled with large silhouettes of intense layering and wreaked of radicalism. Each look represented a slice of opposition, more specifically from the youth. This collection also happened to be shown a bit before the 9/11 attacks, but is believed to be more of a quiet observation of racial tensions and political turmoil in northern Europe at the time. Skirted bomber is actually a repurposed surplus military bomber with a detachable skirt made with thick double layered cotton. Faded and meant to look worn. First look that walked the catwalk. 8/10 condition. One Size, Fits S-XL. 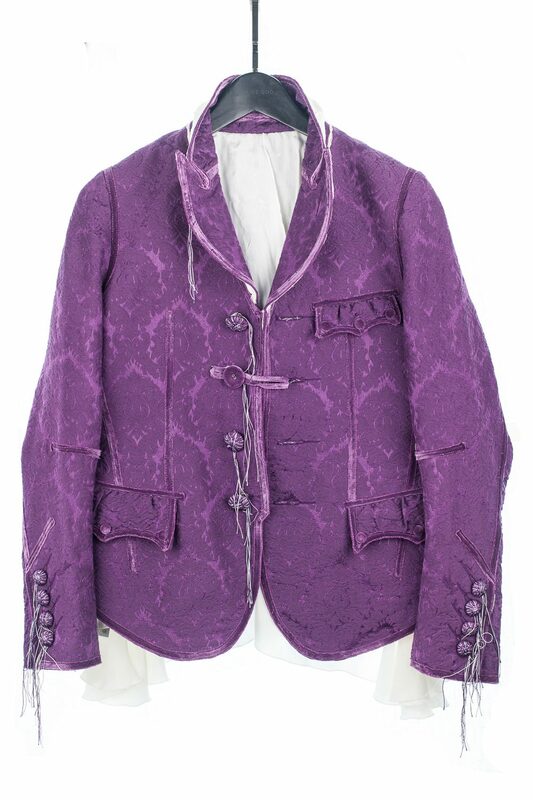 Number (N)ine FW09 Layered Silk Floral Jacquard Light Jacket. FW09 was the magnus opus for Takahiro Miyashita as he exited N(N) -- what his fans thought was his permanent departure from his creative aspirations. 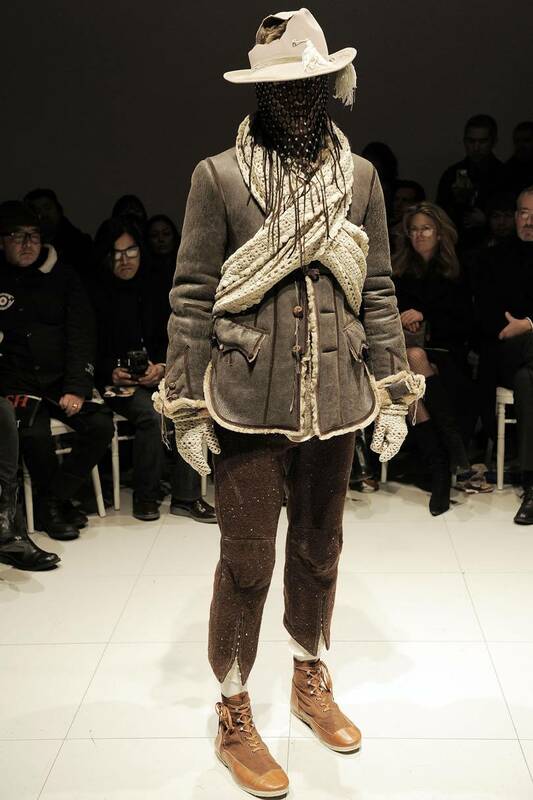 The collection featured 18th and 19th century influences with intricate tailoring and masterful craftsmanship. One of the more costly collections, Miyashita's FW09 creations featured layered pattern silk for lining, embossed floral designs and velvet appliques. This is the most detailed version of the jacket featuring an embossed floral design throughout the silk outer with the silk floral lining extending from the edges of the jacket. Continuing the interview with Takahiro Miyashita, the focus shifts towards the stylist of Number (N)ine: Hirishi Noguchi. Long term N(N) stylist chimed in on Miyashita's outlook with the brand stating that "Miyashita wasn't partial to the brand since 2007". This occurred after his 2006 "Axl Rose" collection which Miyashita debuted as a "joke", but the audience's reaction was too stern for the designer, leaving him disappointed. He was expecting Miyashita to step down from Number (N)ine since fall of last year so it didn't come to a surprise when the announcement came 08 of January. Noguchi then knew that the following collections were purely out of the designer's creative aspirations with little interest in monetary return. The interview closed with Noguchi stating that he sat back, understood the path that Miyashita was taking and simply "watched him run". New with tags. Has the maxfield tag still attached for "$3800". Size 0 fits xs. "There are three reasons to come to Paris: Hedi Slimane of Dior, Tom Ford of Yves Saint Laurent and Helmut Lang. Actually, there is a fourth -- Raf Simons, who in a parking garage on Sunday night -- on a platform made of crushed soda cans -- superbly articulated how contemporary culture has become a thoughtless Pac-Man, gobbling up products as well as references. 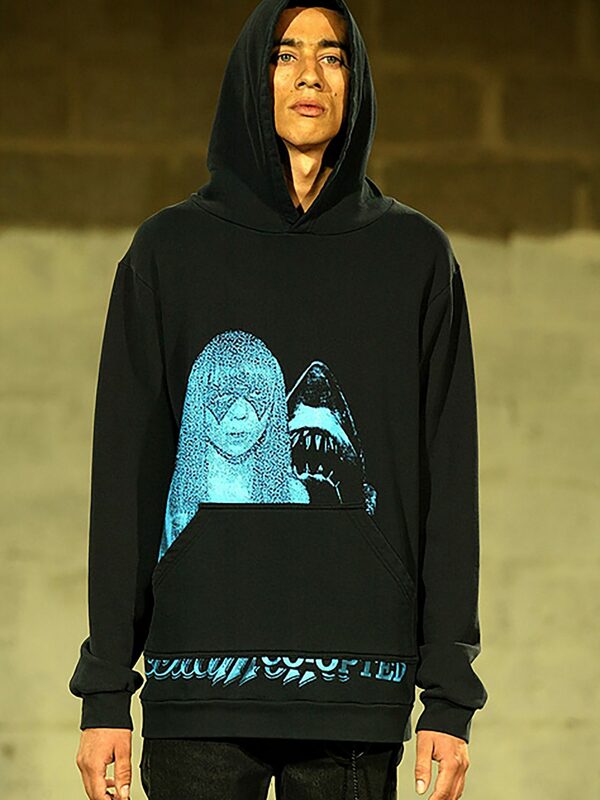 It's rare for a designer to make a political statement in fashion and still offer wearable clothes" -- Cathy Horyn 2002 Raf Simons SS03 "Consumed" Penelope Tree Shark Hoodie in blue over black. SS03 "Consumed" is Raf's quiet observation of consumerism, or to be "consumed" by consumerism -- Its effects on youth; Their impartial interaction with such commercial entities and the molding of adolescent identities rooting from the collective indifference towards the squandering influence of commercial identities. This is the iconic and highly sought after hooded sweatshirt featuring Penelope Tree, from Truman Capote's Black & White ball, and Steven Spielberg's mechanical shark from Jaws in the backdrop, with "Diamond Co-Opted" written underneath the kangaroo pocket. The Penelope Tree print featured here on the hoodie derives from a picture which served as a pivotal point in fashion, youth culture and high society America. The original black and white picture has beanpole figured Tree staring dauntingly out in the distance from amongst a group of middle age socialites. This grabbed the attention of prominent figures of fashion and despite strong opposition from Penelope's father, as she was 16, Penelope Tree became the quintessential swinging sixties icon which galvanized female youth culture and movements at the time. Furthermore, inspired a generation of artists and designers to look at youth culture for inspiration and solidified the Youthquake movement. As for Raf Simons, and this is purely out of speculation, Penelope Tree holds a special place of interest as his source of inspiration will be and has been the youth. 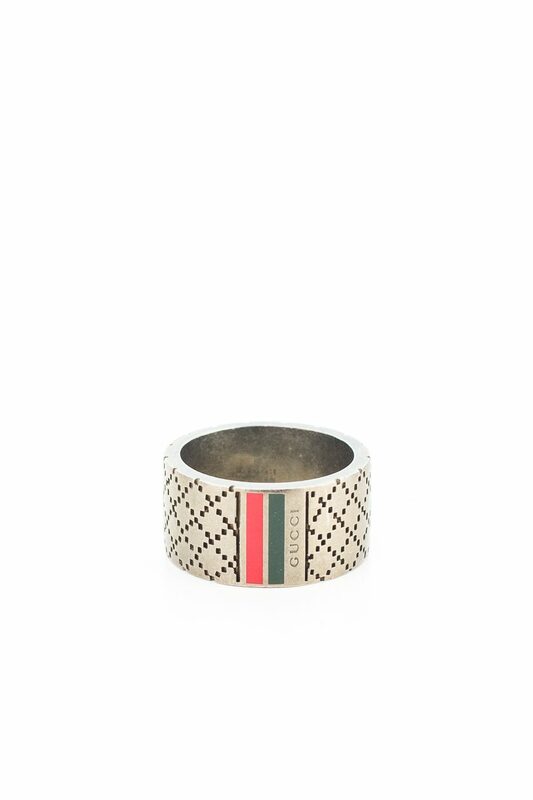 Gucci Patterend Striped Ring. 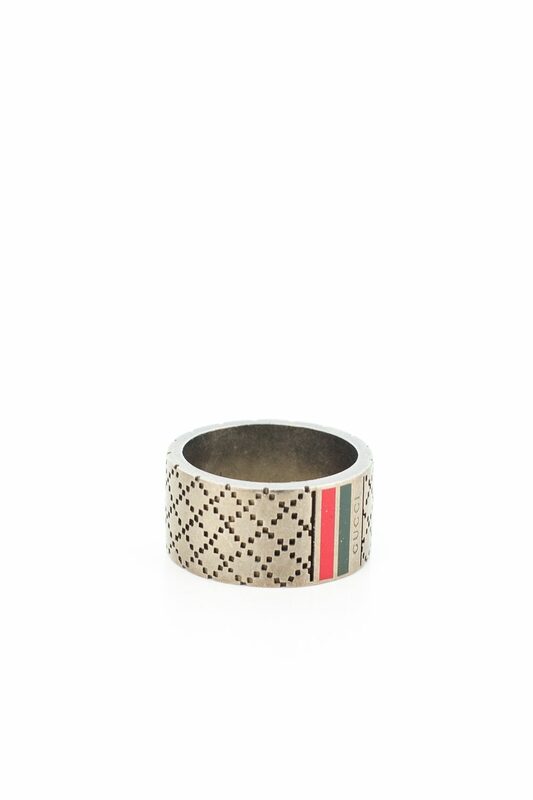 Embossed rhombus pattern with signature Gucci green/red stripes. Sterling Silver. New with box. Size 21 and 23. 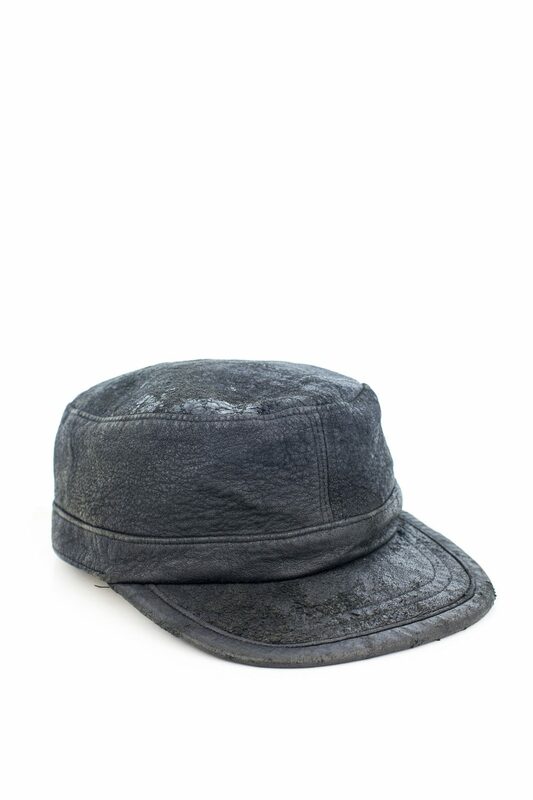 Rick Owens Mainline SS08 "Creatch" Blistered Lambskin Infantry Cap. Rick Owens accessories rarely come and go for the mainline with each piece being completely unique per season rendering them collector favorites. Some outside of hats may include leg warmers, My Little Pony toys, necklaces, do-rags, mink fur dolls and more. 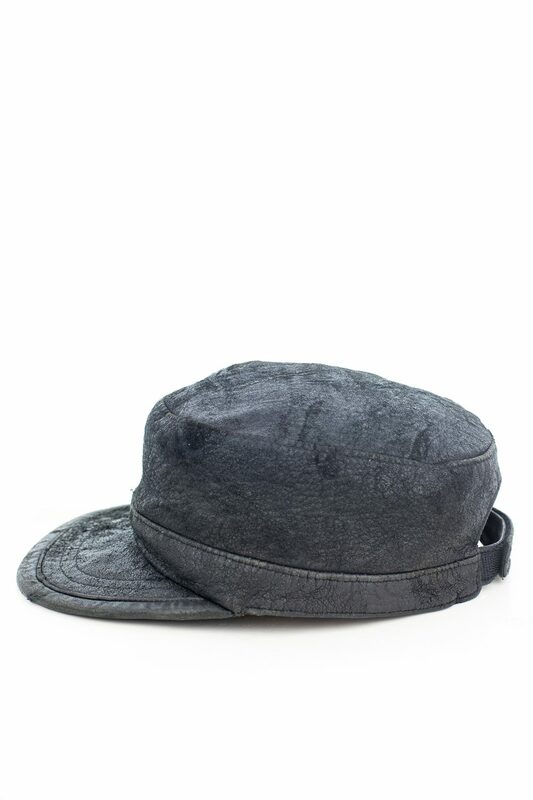 The cap featured here was produced in multiple iterations for SS08 with different materials including cotton, python and lambskin. 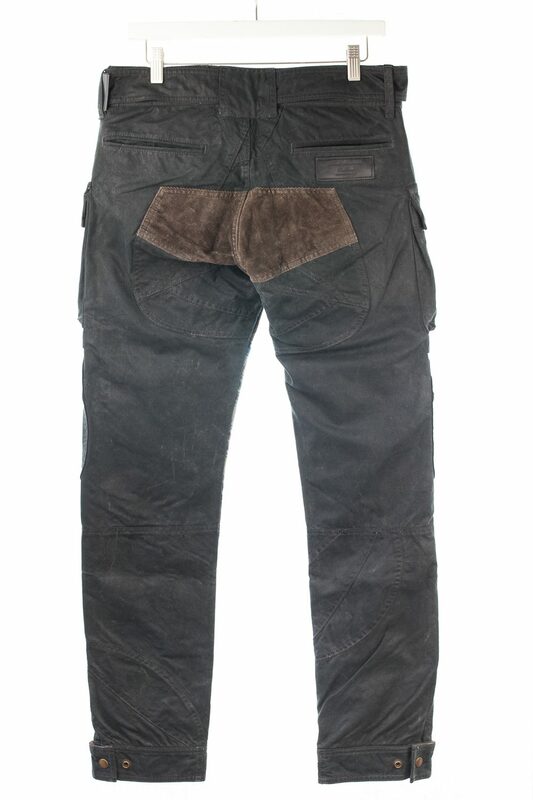 Lambskin went through a distressing process allowing the exterior to "blister" and form an abrasive texture throughout the surface -- A signature Rick treatment. Adjustable velcro back strap. 8/10 condition. 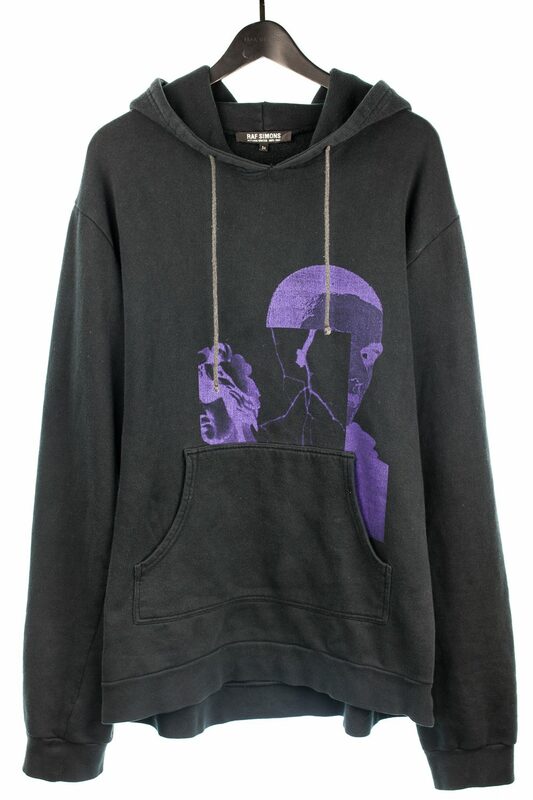 Size M.
Raf Simons AW05 "History of My World" Hoodie with Peter De Potter graphic. Raf's relationship with Peter de Potter is the foundation for the label's well acclaimed cryptic graphical works. Both graduating from The Royal Academy of Fine Arts, and originally a supposed one time collaboration for 2000-2001, the two worked together under the guidance of head of fashion Walter Van Brenondoink (a strong advocate of interdisciplinary work) with photographer Willy Vanderpere and stylist Oliver Rizzio to create the book "Isolated Heroes", the catalyst to Raf's prime years. Raf Simons later borrowed photographs from said book in a recent collection titled "Isolated Heroes". Crafted poems, graphics, collages which abruptly collided with Raf's relationship with music or youth and were displayed in a vague, enigmatic medium was spearheaded by Peter de Potter and continued 9 years after Isolated Heroes. Due to the nature of the graphics, the words or prints on Raf's clothing is a melting pot of musical and personal references which require acute dissection. Seems though, there's something -real- which emanates past all those layers that make some gravitate towards Raf/Peter's work. 9/10 condition. Size 54, very rare size, fits big, XL-XXL. 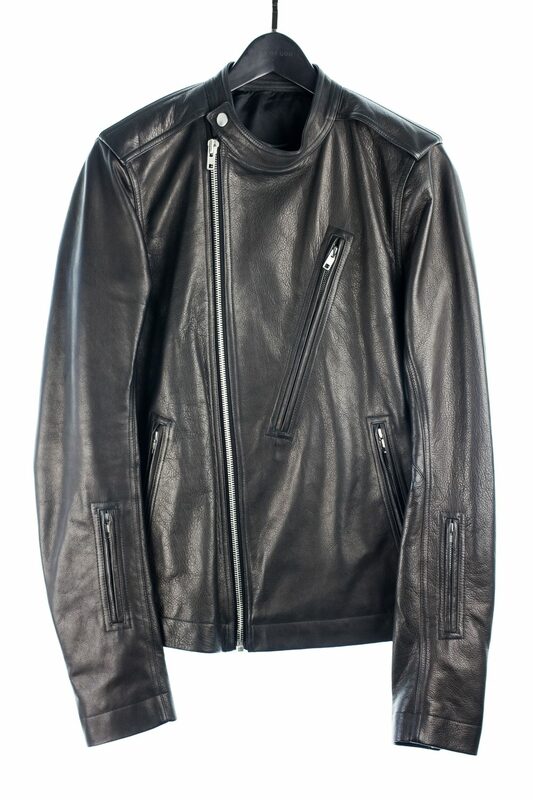 From the iconic SS16 (Cyclops) collection, Rick Owens refined his Moto Jacket cut with soft thick calf leather giving it a rather structured look. Like most other looks in cyclops this jacket was strongly influenced by militaristic aesthetics. 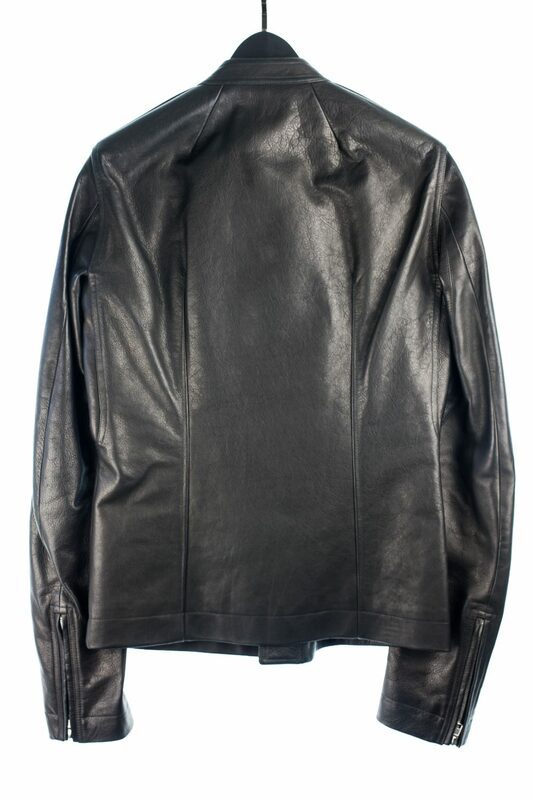 The zipper is angled across the front panel of the jacket complementing the asymmetrical subtle details. Featuring many pockets and high quality zippers this jacket along with other Rick jackets is one that can withstand a lifetime. For cyclops, Rick Owens instructed his models to walk the runway sporting fur covered tubes over the head blocking their peripheral vision. Rick described the philosophy behind this with a metaphor on masculinity: "This Rick Owens spring summer 2016 men's collection is titled Cyclops a monster with a narrow focal point. I can see this in myself in my determined urge to find the straightest line from point a to point b as quickly as possible. A trait I have always assumed is mostly a masculine one. And I’m constantly trying to make sure this ambitious urge for efficiency and control doesn’t teeter over into aggression. I suspect a lot of other men wrestle with that too." Size 48. New Without Tags. 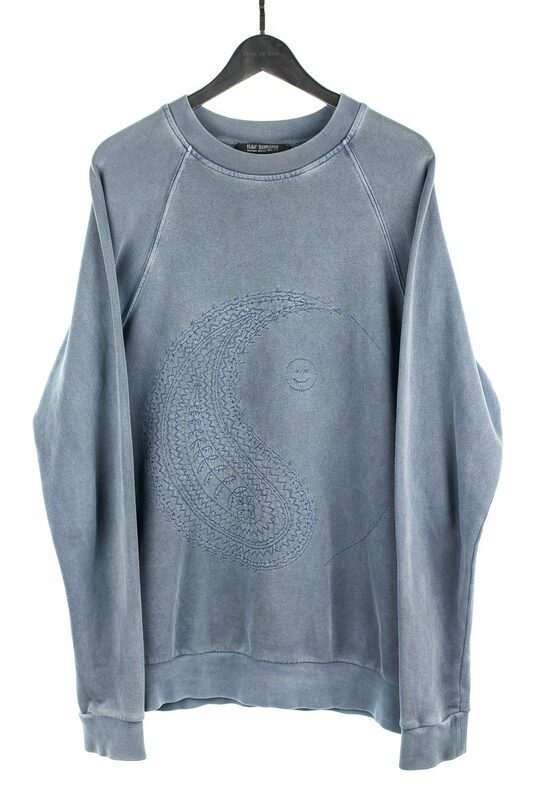 Raf Simons AW04 "Waves" Paisley Yin/Yang Crewneck Pullover. The Ying/Yang design was used throughout the collection as a possibly reference to a euro-techno recording label and a nudge to the "Waves" ethos which is summed up beautifully here: "The collection for explores the idea of conscious confinement and wilful enclosure. Again starting with the concept of an imaginary community outside of regulated society, the whole of the collection evokes the feeling of enlightenment and personal enrichment one can find in extreme but self-chosen isolation. The collection references at random various drop-out cultures that are conceived as likeminded tribes but when examined closely, are in fact gatherings of individuals seeking self-fulfilment through lonely practice. Wave cultures, cultures of rave waves and ocean waves. Eyes closed, alone with music, living only inside music, happily disappearing into the vortex of sounds and emotions. Arms wide open, alone with nature, taking to the sea, drifting away from the shore, fully realising the only options are drowning or surviving." Size 46, fits oversized. 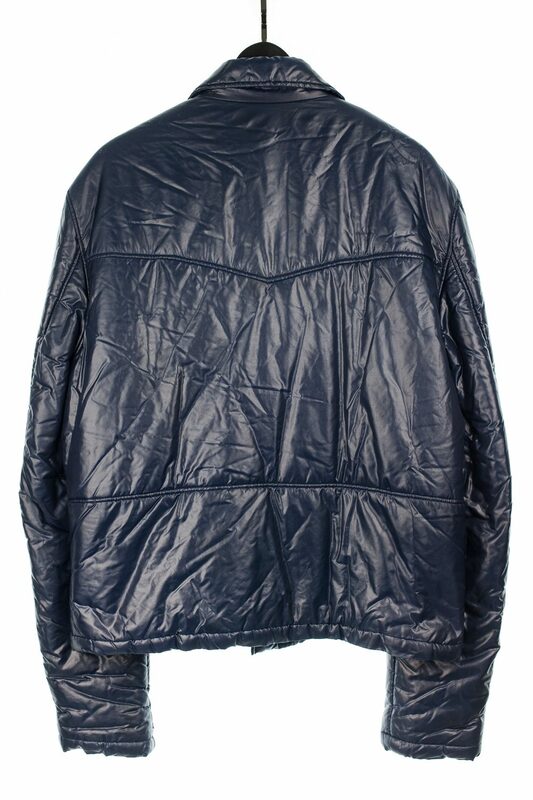 Can accommodate an S-L.
Raf Simons AW03 "Closer" Puffer Down Moto Jacket in a dark navy. Simons's "Closer" touches base with his roots to music, especially with Joy Division and New Order, with Raf's Peter Saville admiration spearheading the entire collection. Taken from the Mode Museum in Antwerp: "This season, Raf Simons was granted full access to the archives of Peter Saville. Raf Simons made a personal selection of Saville-designed works (some of them previously unseen) to integrate them into his collection. 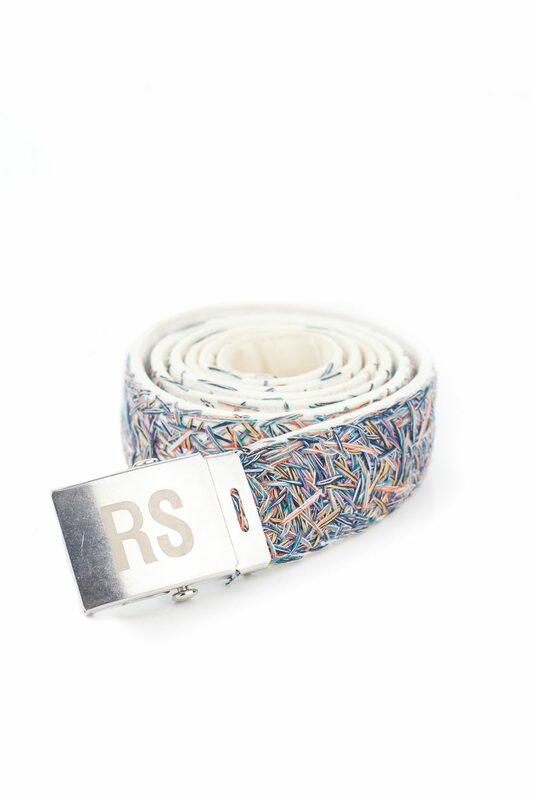 As a long-time admirer of Peter Saville, Raf Simons considers this a great honour, and therefore dedicates his collection to the man who put an unique spin on music culture. The collection itself focuses on traditional styles and fabrics, augmented by a mod influence. Linked to the aesthetics of Peter Saville, there are also touches of early Russian Constructivism, Bauhaus and vintage British looks. At the same time, the collection reflects on the process of growing up and (re)considering adulthood, citing references to childhood dress codes, formal business looks and ghetto rebellion." Cleanly executed crossover of a puffer jacket and moto jacket, which nods to two different functions and styles from two worlds and tailors them harmoniously together. Puffer jacket is structured as a moto jacket and sought to be fitted close to the chest. 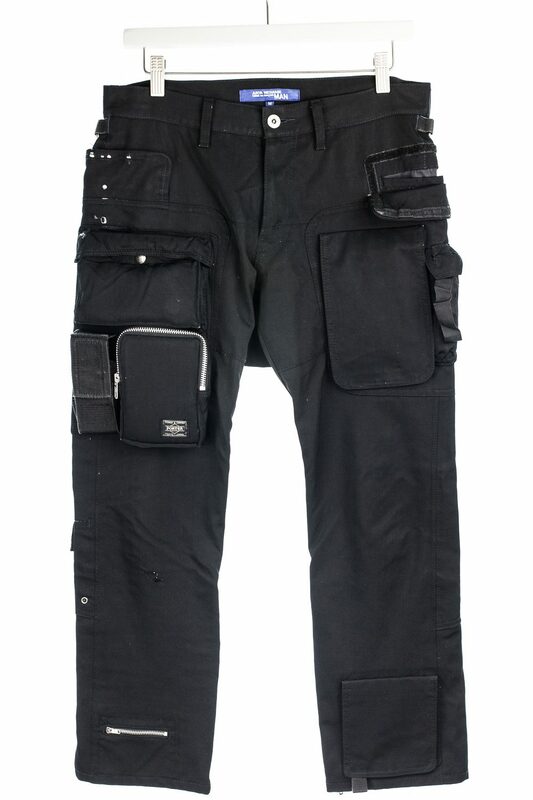 Multiple functional zip pockets. Snap button down lapels. Round and wide silhouette. 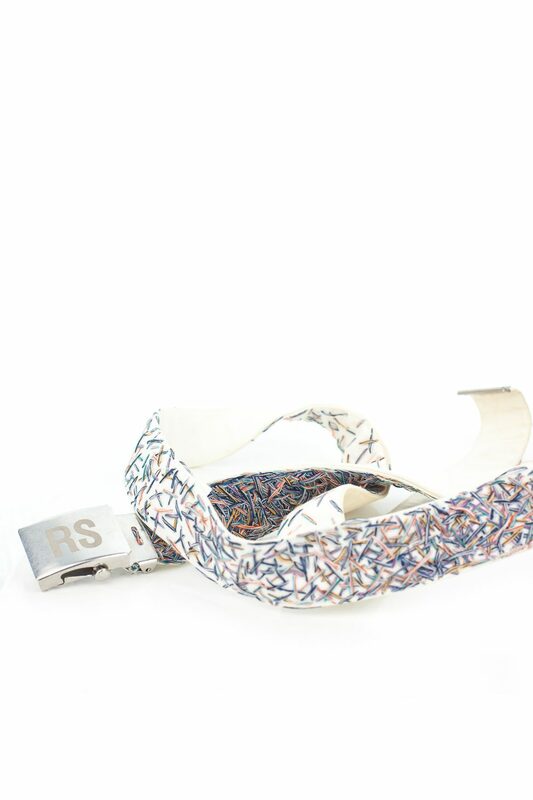 Adjustable waist buckles. Arm pocket. High waisted. 8/10 condition. Right pocket is blown out and needs repair. Size 54, extremely rare size. Fits an XL-XXL. 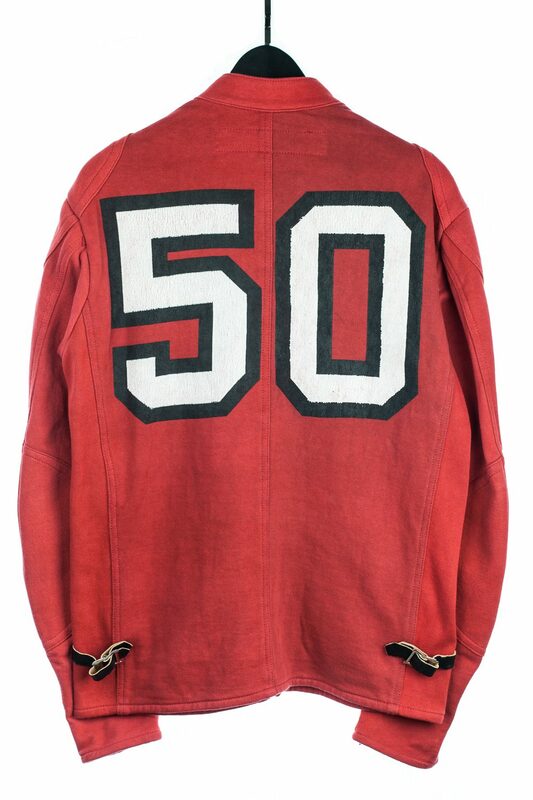 Junya Watanabe SS06 "Arkansas Football" Varsity Moto Jacket in Red. Many forget that Junya Watanabe's "Man" line is unlike his more focused self titled women's which roots original ideas from season to season. 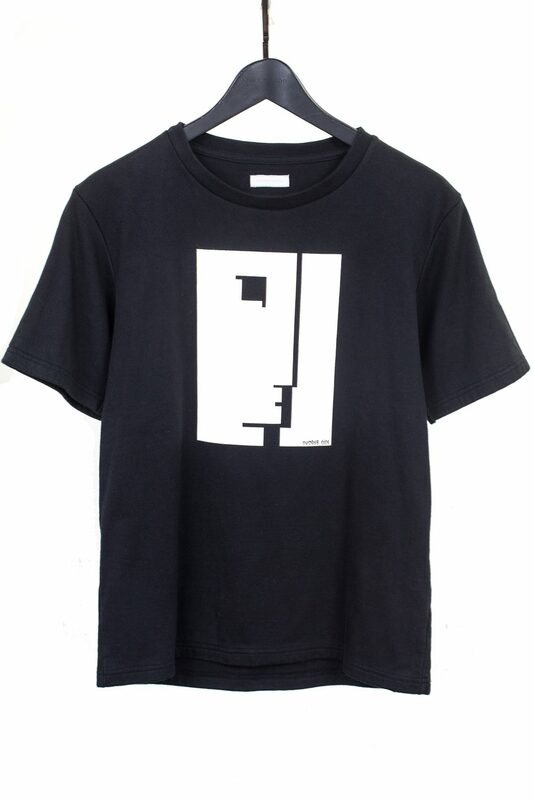 The 'Man' line typically reintroduces multiple themes and designs from Watanabe's time capsule which borrows or reissues from older seasons -- Most common being the "poem" designs which were released in 2001, 2005, 2008/09 and recently. The varsity theme is one of the few themes that stays unique to only two years: 2002 and 2006. The season featured nostalgic motifs from middle America varsity sports and school mascots. Pants, hoodies, tees and shirts sported graphics of said mascots and logos. 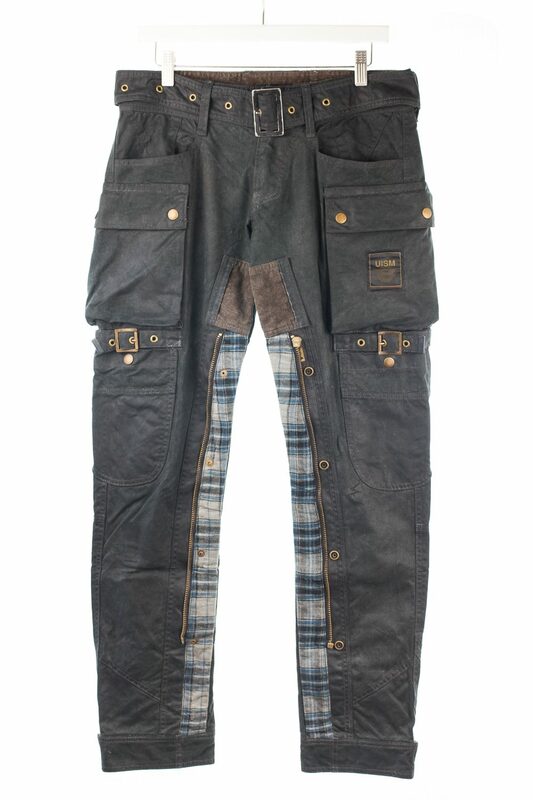 Unique to this season however, a handful of these designs were printed on garments with biker details which were indicative by padded knees, shoulders and zips on limb ends to tuck boots or gloves under. 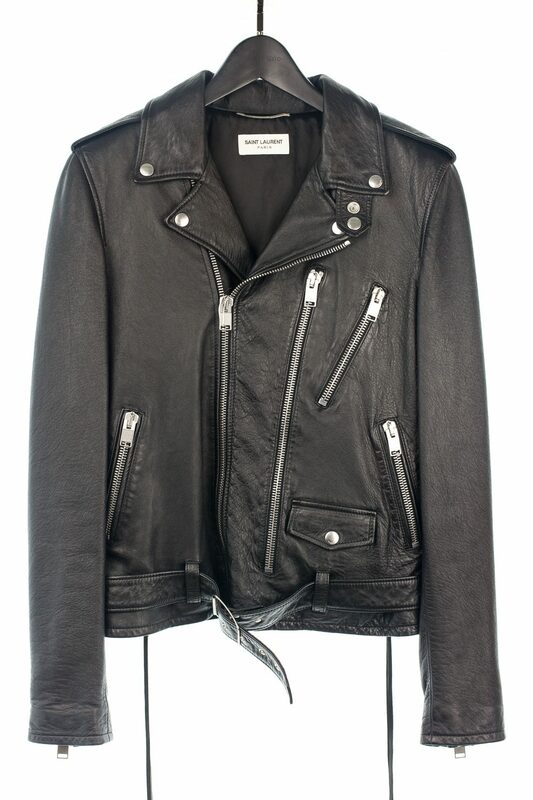 Moto jacket is of a sweatshirt material. 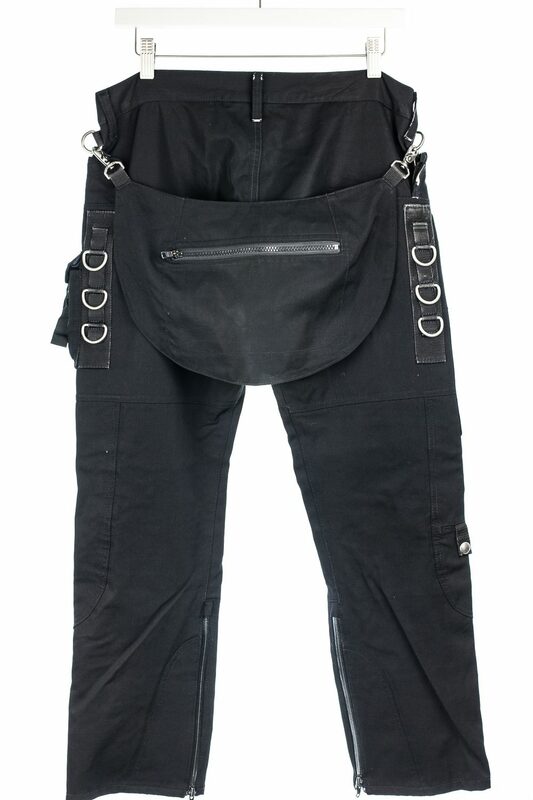 Moto details include adjustable leather waist straps, padded details, zippered pockets and wrist zips. Faded red. 8/10 condition. Distressing on graphics. Size L fits true.